James (Jim) R. Hawkins was born (in 1935?) to Ruby Ray and James Otis Hawkins in Texarkana, Texas. The eldest of two brothers, he was raised primarily by his single mother most of his childhood. In high school he excelled in football and was given a scholarship by the University of Arkansas to play for the Razorbacks. However upon attending his first Arkansas football game he was won over by the pride and pageantry of the opposing team - Baylor University. In 1952 Ruby married Tom Ledbetter and shortly thereafter moved to Waco in order to start a new salon, the Cottage Beauty Shop. This allowed Mr. Hawkins to attend Baylor University, where he joined the ROTC and earned a degree in accounting. After graduating he joined the military meteorological service for four years before returning to Waco and completing his CPA. Working as an accountant he learned a great deal about what worked and what did not in the business world through the experiences of his clients. In the 1960s he began to branch out into business for himself, starting with the purchase of several Gibson's Discount Centers in order to create a capital base. In 1976, the J-Hawk corporation was born. Eventually Mr. Hawkins sold off his interests in Gibson's (primarily to Sam Walton's now-booming Wal-Mart empire) and in 1986 turned his attention to the buying and selling of distressed assets. Early successes lead to a fruitful financial partnership with Cargill that flourished into the mid nineties. In 1995 Mr. Hawkins left his partnership with Cargill to become the chairman of the FirstCity Financial corporation, a Waco-based company focused on purchasing and resolving loan portfolios and managing the disposition of real estate properties. Mr Hawkins retired from FirstCity in 2005 but continues involvement in J-Hawk to this day. Jim and Nell Hawkins have a long history of local involvement and philanthropy in the greater Waco area. They are closely connected to Baylor University; both are members of The President's Club, the Baylor Bear Foundation and the Baylor/Waco Foundation. Jim served on the National Steering Comittee in Baylor's attempt to obtain the George W. Bush Presidential Library in 2003. 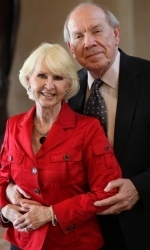 Jim and Nell also have supported several areas of Baylor's Hankamer School of Business, including endowed scholarships and endowed faculty and staff positions. Jim has served on the Hankamer School of Business Board of Advisors and the Baylor Foundation's board. Nell is an Art Angel for Baylor's Martin Museum of Art and is known for her role in initiating the Gold Rush Campaign that transformed the spectator experience at Baylor's athletic events. They have supported scholarships for student-athletes as well as excellence funds for basketball, tennis and baseball, the Baylor Bear Foundation and mission trips by Baylor's Sports Ministry Team. They generously provided the J-Hawk Limited and Nell Hawkins practice courts for Baylor's men's and women's basketball programs, and their first significant gift to Baylor Athletics funded the scoreboard at Floyd Casey Stadium. Most recently, on January 25, 2013 the Jim and Nell Hawkins Indoor Tennis Center was dedicated, providing a 34,000 square foot practice center for Baylor's high-performing tennis teams. Concerning the City of Waco, Jim is the past President of the Greater Waco Chamber of Commerce, the Waco Independent School District Board of Trustees and the Waco Business League. He received the Distinguished Service Award from Waco ISD in 2000. Nell is a member of the Historic Waco Foundation and served on the Cameron Park Zoo Board of Directors. The Hawkins have made many donations to the zoo over the years, notably a $1 million gift in 2009 for a new orangutan exhibit. They also support MCC, providing scholarships and donating a $575,000 gift to the MCC Foundation that funded a scenic outdoor plaza surrounding the entrance of the Science Building. In 1997, Jim and Nell Hawkins were honored as Philanthropists of the Year by the National Society of Fund Raising Executives. Hawkins And so, the gifts I really have enjoyed the most is the gift to the practice court. That’s been one of the more gratifying. Sloan Which I think is both courts, right? Sloan There’s a J-Hawk [Limited] court and then there’s--Nell’s got a court [Nell Hawkins] right there. Hawkins Yeah, and the reason is I think it’s meant such a difference in recruiting. And kind of the way that thing came about - Kim [Mulkey] had been on me a long time just, “Why are you giving the money to the zoo?” You know, she saw that million-dollar gift to the zoo, and she just, “Well, why--” and she just kept on me about it. And so, I just kind of dodged her and ignored it and went on. And then, we got up to the--Indianapolis--in the final four. And then, we were talking one night, and she said, “You haven’t forgot my practice court have you?” I said, “Well, Kim, I tell you what, you win this thing; you’ll get your practice court.” And boy, she came to me the next day. She held me to it. Sloan Well, you mentioned kind of thinking of B. [Bernard Rapoport], and you’d--we talked off tape a little bit about your relationship with him. I’d love for you to share that as well. Hawkins Well, we’ve known each other for a long time. And like I say, he’s been my role model and has really, even--we’ll have different philosophies on the politics of things: he’s on one end of the deal, I’m on the other--we can really get together and oh--our fellow trumpet ideas. And really, he has so much fun and has so much gratification from giving, that it’s a big part of his life--big part of his life. And I’ve seen him do it and seen how he takes care of it. That’s kind of has set the role for me. And I see where he’s coming from. I understand why he does that. So, he’s my idol. Hawkins Yeah. (both laugh) Right, yeah. Yeah, he’s something else. He is something else. We went to his ninetieth birthday party and watched him--I don’t know if he told you about it or not? Sloan He did. He showed me some pictures, yeah. Hawkins J. Rockefeller’s place. And that was something--something to see. And if you had been there--you know, had Hillary Clinton there, and [President Barack]Obama sent a thank-you--a congratulatory note. And I didn’t realize he had supported both of them. (laughs) But I guess I should have known. (Sloan laughs) But you had every Democratic senator and every politician you could think of there. It was really something to see--really something to see.